Whew! It has been hot this week! Of course, the vines are still growing fast. I’m beginning to wonder if our poor, late planted, stunted tomato plants are going to do anything at all this year. I’m not overly optimistic. At least we have the hanging basket tomatoes! The ornamental millet in the Prairie Star Annual trial is growing almost as fast as our vine crops, as well as turning that delightful color of purple. This is a close up of the ripe ‘Gold Rambling Stripe’ cherry tomato that we picked off one of the hanging baskets earlier this week. 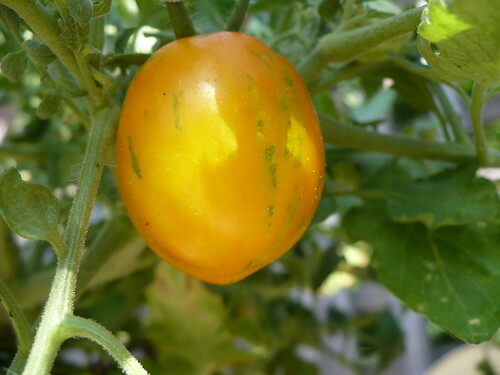 It’s pretty big for a cherry tomato, which is nice if you are growing them because of lack of space, rather than as a novelty. The runner beans are still fighting the herbicide injury. Most of them are probably going to die in the heat over the next couple weeks. They have almost no roots on them. Some of the other beans are looking a little better, but I’m not overly hopeful of their productivity this year. When I was out taking pictures of the vine plants this week, I happened to get a couple pictures of this hard at work bee. He was flying back and forth on the melon flowers quite happily, and picking up quite a bit of pollen from the looks of it! The leaves on this Fairy Squash are so artistic that I had to have some fun with the photo editing software through Flickr! A simple “vivid” color enhancement. And another look. 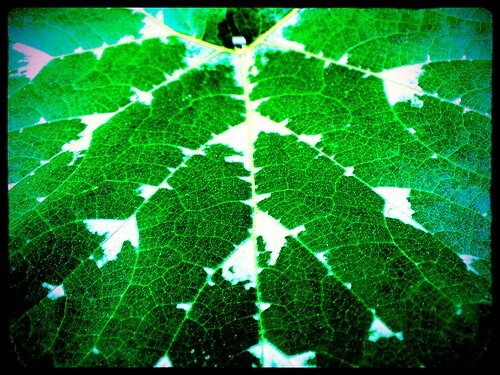 It’s so fun how the different edits show the veins in the leaves differently! With all the heat, our vine crops are having a ball and growing like crazy. 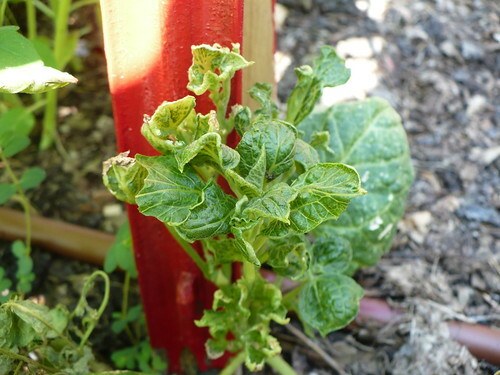 I took some pictures earlier in the week of the different plants to gauge where they are at in starting to produce. Mostly I was looking for the presence of flowers, and if flowers were present, then I was looking to see if the flowers were male (for pollen) or female (fruit producing). We need both male and female flowers to get anything off of a particular variety. Female flowers have a swollen area behind the flower that often looks like a miniature version of whatever the fruit is supposed to be. The ‘Salt & Pepper’ cucumber is blooming, but I only saw male flowers. No cucumbers on this vine yet! The ‘Rocky’ cucumber is much farther along. A check of the label says 45 days to maturity, which would explain the early fruiting! 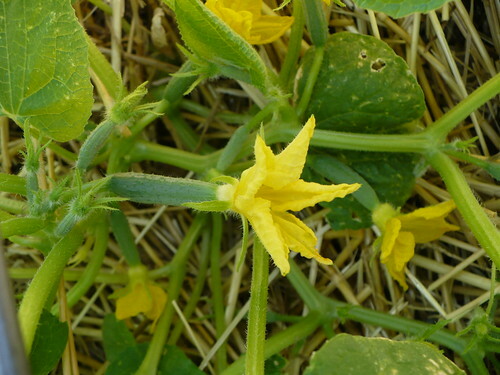 These are little 3-4″ long snack cucumbers. 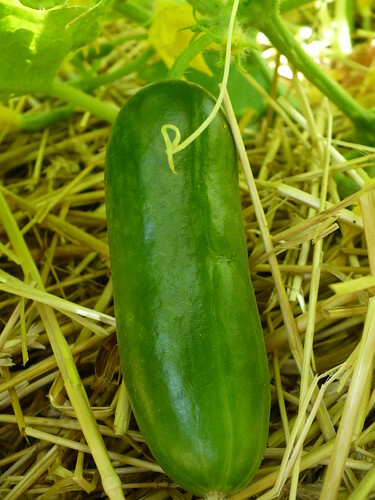 We’ve harvested 4 of these cucumbers just this week . 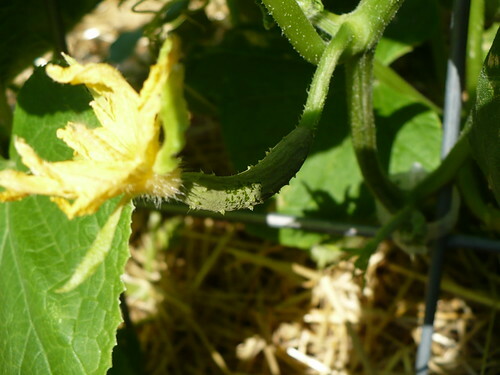 The ‘Cucino’ cucumber is not far behind, with lots and lots of female flowers setting cucumbers. They will be producing like crazy by early next week. 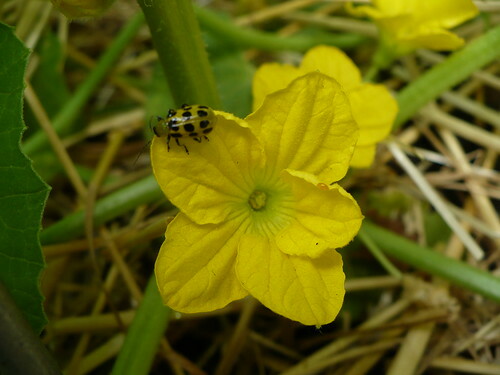 I did find this one lonely female flower on the ‘Sweet Success’ cucumber plant. It is a little bit later and produces 14″ fruit, so I’m not surprised. 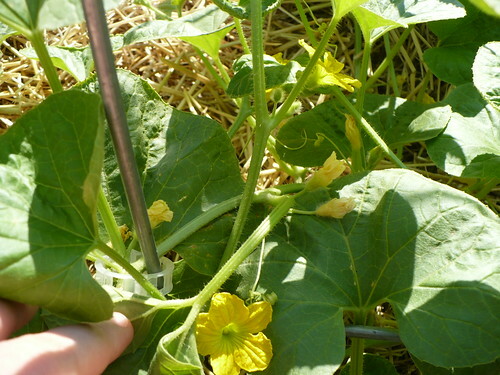 The ‘Suhyo Cross’ cucumbers, another long, slicing type, are also lagging behind. I didn’t see very many flowers at all, and certainly no female flowers. 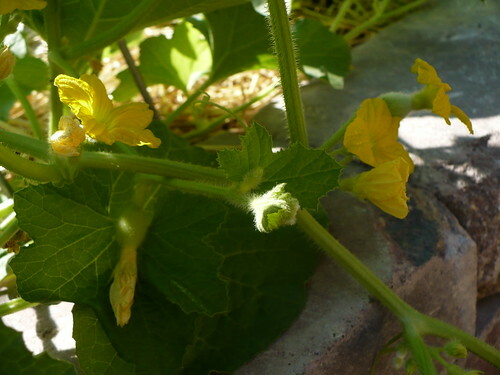 The ‘Kazakh’ melon has lots of flowers, but they are mostly male flowers. I did manage to find one or two female flowers, and those seem to be increasing toward the end of the week. The ‘Honey Orange’ honeydew melon is in much the same state. There are lots of male flowers, although if you look close at this picture, I think you can find 2 female flowers. This is the ‘Pinnacle’ spaghetti squash. Again, mostly male flowers, but I did find this female flower. From checking this morning, it looks like it was successfully pollinated. This is ‘Lil’ Pump-ke-mon’ ornamental pumpkin. you can see that it had some male blooms earlier that have died and now has some female blooms. I couldn’t tell for sure when I checked this morning if any of them have actually been pollinated. 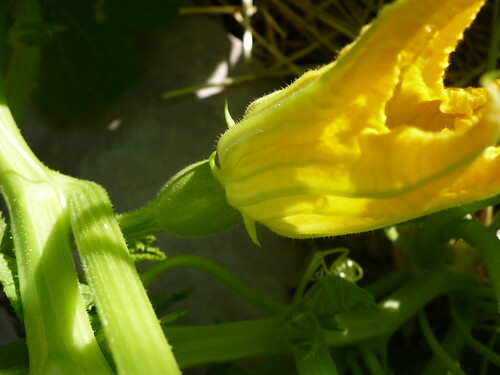 On the other hand, the ‘Sunshine’ Kabocha squash hasn’t had tons of flowers, but I’m pretty sure that this squash is successfully pollinated and growing. We’ll be sure to keep and eye on it. 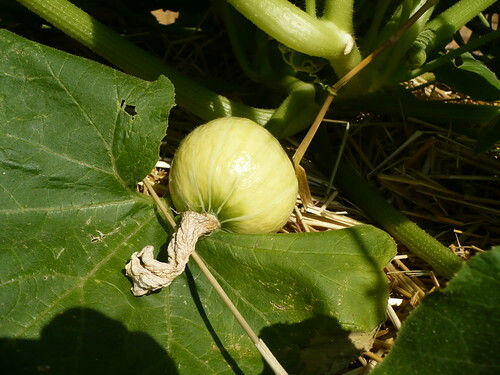 This type of Kabocha squash is supposed to be a bright scarlet at maturity. That’s what’s going on in the Vertical Garden this week. There are some other vine crops throughout the garden, but I’ll cover them in the context of “whole garden” overviews in the next couple of weeks. We have our first harvest out of the Demo Garden today! 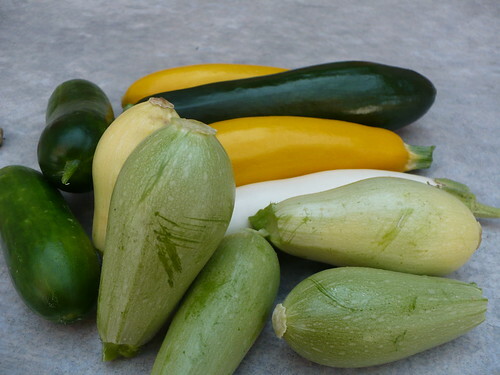 We have several of the ‘Sweet Gourmet’ squash from the Mexican garden, a ‘Gretel’ eggplant from our wheelchair accessible container garden, 2 ‘Rocky’ snack cucumbers, and 3 zucchini from the Family of 4 Garden. Meanwhile, we also had lots and lots of vines to train up to the trellises. They have been going crazy in this heat! I’m glad something enjoys the heat. 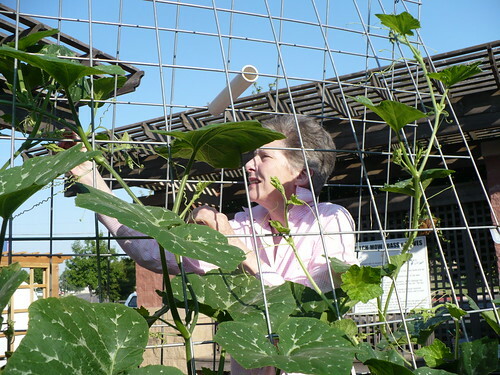 The ‘Fairy’ Squash is so crazy that we had to climb up under the trellis to get the vines on the trellis. 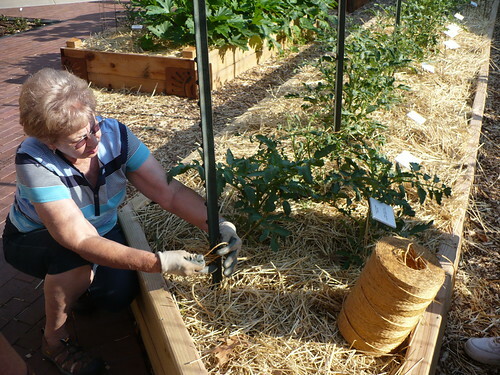 We were also a little past time for tying up the non-caged tomatoes. We had to put 2 layers of twine on most of the plants. They are starting to bloom, but still showing ill-effects from the herbicide injury. 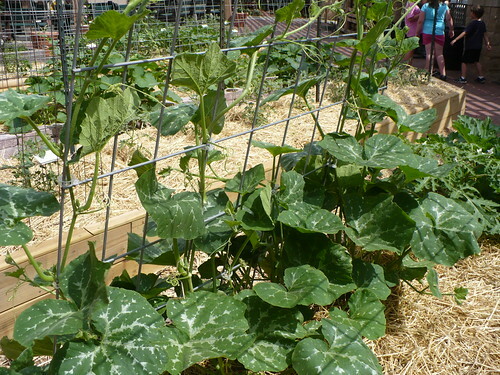 Wilting Squash Vines…Well, That’s a Bad Sign! **Sigh**. Seriously?!?! 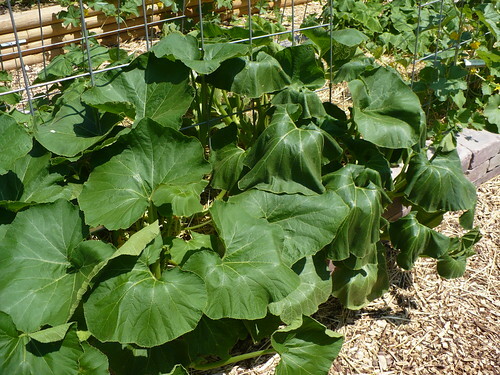 Looking at this wilty squash plant (It’s the ‘Sunshine’ Kabocha, in case you’re interested), there were 3 possible problems. 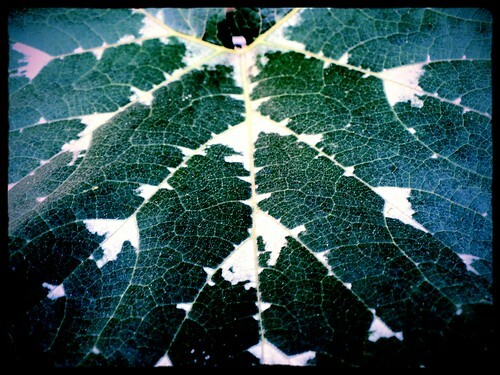 1 – the plant needs water. Nope, the soil was moist. Darn…that’s the easy fix! 2 – That pesky overwatered & damaged the roots problem. Well, theoretically possible, but we’ve been pretty careful recently, and it has been plenty hot to keep things from staying too wet very long. 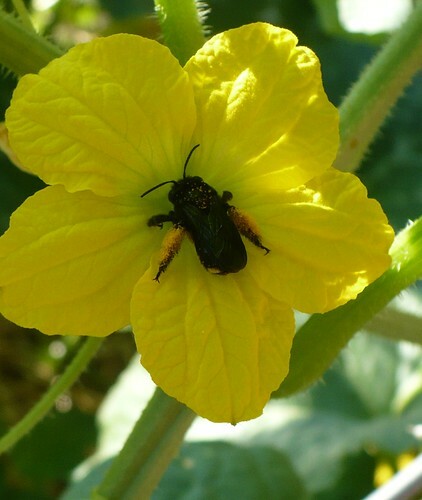 3 – Squash Vine Borers have attacked. We have been scouting, but that’s not perfect. So, I checked out the base of the plant for signs of invaders. I realize it is kind of hard to see in this picture, but there are the few spots where you can see the orange goo oozing out. That is textbook squash vine borer damage. GRR! I was so hoping we wouldn’t have any this year due to the fresh soil… Oh well, I guess I can be overly optimistic at times if I want to be. Not that it’s a good way to keep plants healthy, but it’s fun while it lasts. So, what do we do from here? 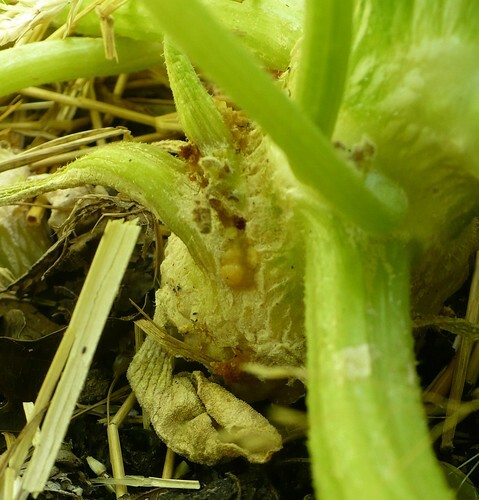 Well, the catch with squash vine borer is that once it is at this point – inside the plants – there isn’t really much to do about it. Some people have good luck with surgery – going in with a knife and extracting the caterpillar, then mounding soil over the wound and hope it puts down some roots and keeps growing. Since our plantings were relatively thick to start with (more plants than we needed), I’m tempted to cut this plant out and spray any other plants, in hopes that we aren’t too late to prevent further loss. 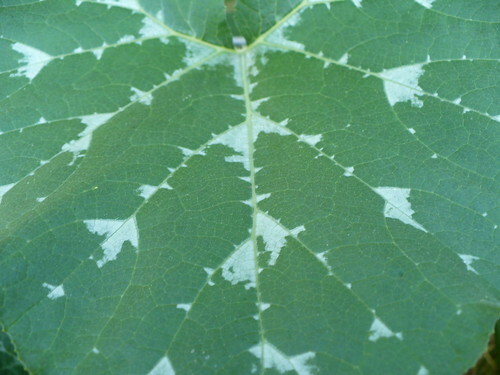 For anyone that has never had the pleasure of dealing with squash vine borer, the only way to kill the caterpillars is to spray the base of the plants regularly with an insecticide in hopes of killing the caterpillars before they bore into the stems. Sevin or Permethrin would be conventional options. Spinosad would be an organic option. I hope we’re not too late to catch most of the critters, because we have a LOT of squash planted in the garden this year! It’s been a pretty enjoyable week out in the garden, and things have been growing very fast! It looks like we’re forecast to hit our first 100+ degree day of the year over the weekend. However, compared to last year, our overnight temperatures are still getting low enough to let tomatoes keep setting. I’m sure we’ll see a few fits and starts on that front as the summer continues. 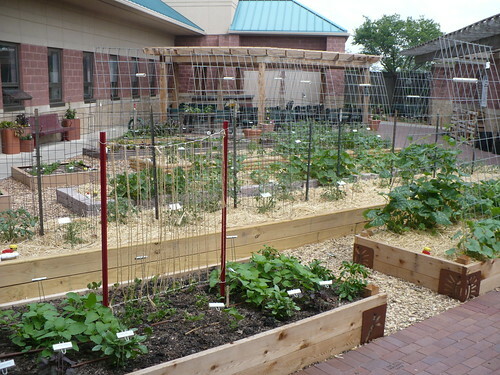 Here’s a look at the garden as a whole from the benches on the end of the garden. You can see that the vine crops are looking gorgeous and lush, while our poor beans and tomatoes still look a bit rough. 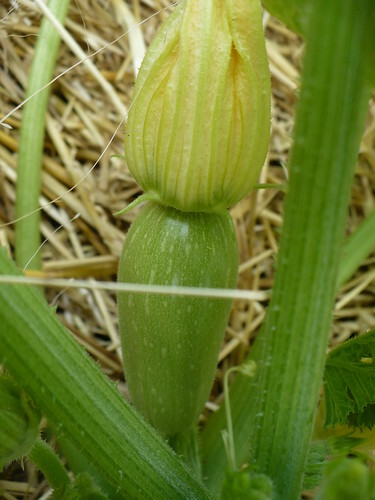 This is a bud on the ‘Sweet Gourmet’ zucchini in the Mexican Garden. We were originally looking for the heirloom ‘Grey’ Zucchini, but couldn’t find seeds in stock anywhere. This hybrid version is that pale green that you might almost consider grey. 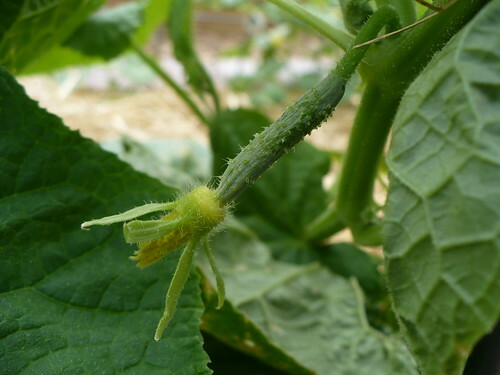 This ‘Sweet Success’ cucumber is getting ready to bloom as well. Actually, both this picture and the squash picture were taken on Wednesday, so they’ve both bloomed and continued growing, while others are blooming today. And yes, I’m too lazy today to go out and take some “in bloom” pictures. 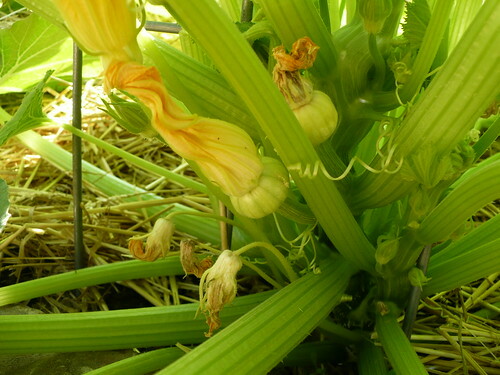 I am loving the ‘Fairy’ Squash, even though it isn’t starting to bloom yet. The silver and green leaves are so attractive, and it is making great progress climbing up the trellis. It might be the first variety to the top of the trellis this year. 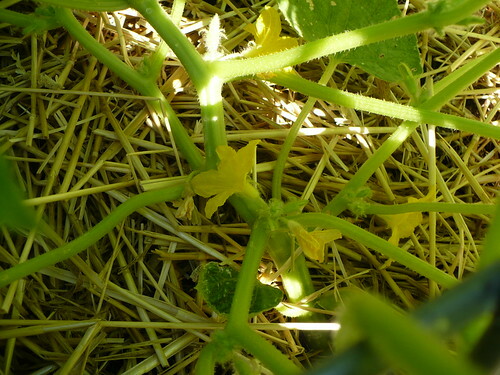 Before we clipped up the vines on Tuesday, the ‘Fairy’ Squash was busy growing tendrils around the straw mulch. 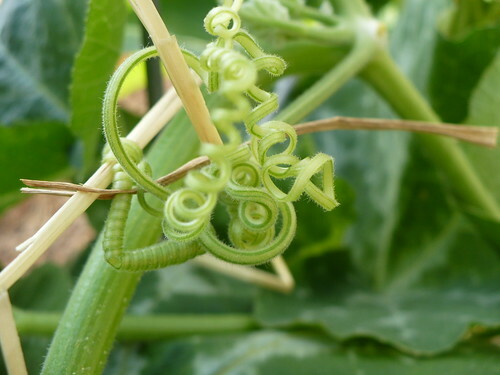 The tendrils are also way cool! 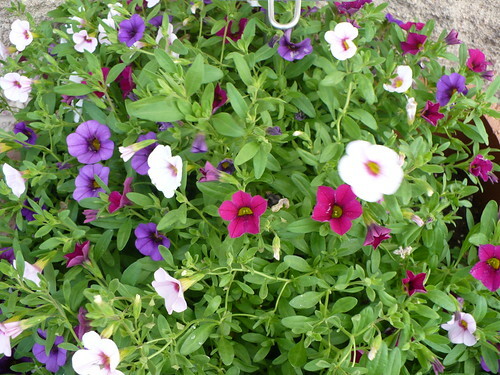 This mixed Calibrachoa is also looking great already this summer. (No, my camera wasn’t shaking…that was the wind!) This is ‘Trixi Berry Daring,’ and exemplifies one of the new trends in the bedding plant industry. 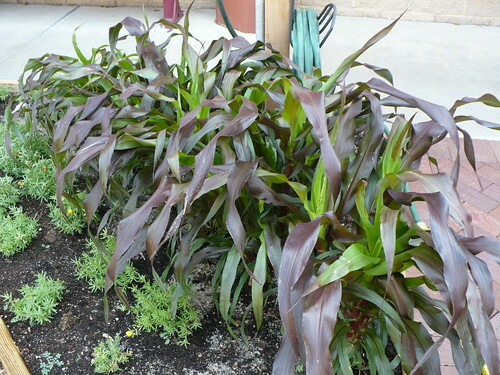 The growers are customizing blends and growing the plants together to get the mixed colors, rather than selling you a 6 pack with single plants of different colors.